Make a plan. Create a list of 4 exercises and 4 stretches you know and love. Make them things that won’t require a bunch of fancy equipment. Try using paper plates. 30 second drill. When a commercial comes on, start your way through the list, alternating exercise and stretches every commercial. There are rarely more than 4 commercials (unless you’re watching a Survivor season finale!) so you should be able to get through 2 stretches and 2 exercises, enough to get you moving but not enough to make you feel like you’re going to drown in your own sweat. Half-timer break. Once you’ve done 2 full sets of your exercises and stretches, next commercial break get up and grab a glass of water. Repeat until your show is over (feel free to substitute a glass of water with a bathroom break if you’re watching a 2 hour special)! Avoid grabbing a handful of snacks on the way through — mindless eating happens most often when watching TV! There’s no real substitute for a well constructed workout with your favorite trainer. But I get it, there’s a lot of addicting stuff on TV. And honestly, I’d rather you get hooked on a show than a snack. If you’ve wondered about getting your flexibility in, wait no longer. Here’s a video from our Bonza Bodies trainer (blast from the past!) Erin J. She shows us a few drills that you can do at home with nothing more than a broomstick. It’s actually surprisingly effective. set up a yoga mat in front of the tv. Nothing says ‘please lie down and stretch’ like a yoga mat. Leave it out and take advantage of it next time you sit down for a rerun of ‘golden girls’. the shower is your friend – buy some non-slip grips for the floor and get your stretches in there. Nothing like a warm shower to get the joints ready for moving. Make it part of your nighttime ritual – give yourself a mindset to work through, some thoughts to embrace and some stretches to squeeze in to make sure you’re going to get a great nights sleep and wake up feeling loose and limber. Anyone out there got a way they sneak in stretches? Don’t say while driving, don’t say while driving…. Jamie Atlas and the Bonza Bodies Team. Ski Conditioning Is Back At Bonza! If you’ve been waiting for us to launch our 21 day intensive ski conditioning program to get you in the shape you need to be to master those mountains, here’s the details! If you aren’t sure what we’re all about, just continue on down to the bottom of this post to see our 9News Wednesday Workout Ski Conditioning spot, read our ski conditioning article in the Denver Post or see why the right training is important in this video from our youtube channel. Choose from 7 Ski Conditioning specific workouts – attend as many as you like! Guaranteed small personalized group size – no more than 16 people per instructor. Kickoff night (optional attendance) is Dec 1st from 6-8pm – this intense workout includes optional body fat testing and ski fitness testing to see how ski ready you are! ! When does the Ski Conditioning program start? 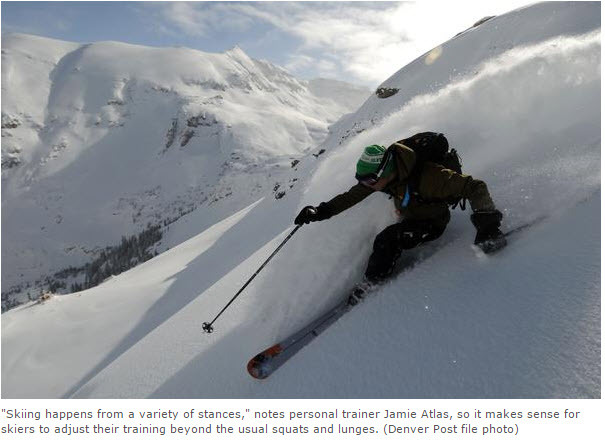 This Award Winning Denver Ski Conditioning Program starts December 1st! How much is the 21 day ski conditioning program? What times do the workouts run? ATTEND AS MANY SKI CONDITIONING WORKOUTS AS YOU’D LIKE!